Some find any topic of toilet conversation embarrassing. The other day a friend asked me what age it's unacceptable for a child to do a sneaky wee as her's had to do it round the side of Lidl when she was caught short. 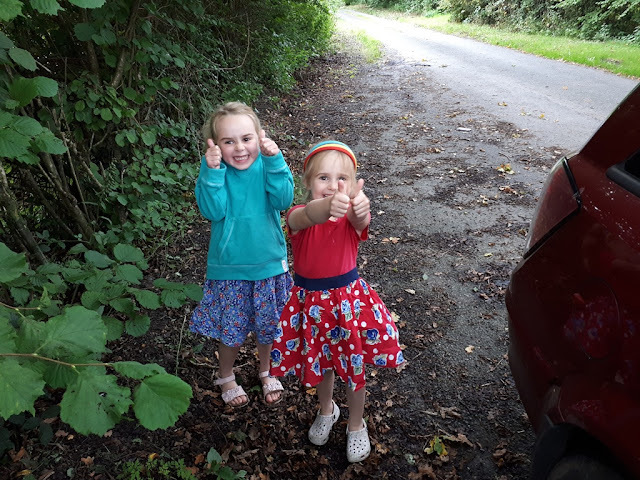 The picture above is when me and the girls were all desperate on the way back from holiday earlier in the year, up a side road and no harm is done. I call them commando wee's. But people can get funny about it. I'll be honest working in the industry I have worked in (construction) and being brought up on a farm, weeing outside is no big deal. In fact living here I normally go outside for a wee than go upstairs to the toilet, some people find that weird, I think it's more weird to use a few litres of water to wash away my urine that's full of great nitrogen for plants, trees and compost as well as human sent that will deter predators from my chickens. Is there an acceptable age to stop weeing outside? Or are you like me and see no harm in it? We stick to weeing in the countryside and I encourage peeing on the compost heaps! It's been a steep learning curve for me to teach the girls to wee outside, there has been some mess created (and wee right up my leg if I've held them wrong)! Love the tomato story, I wouldn't want to be one either! lol - This isn't exactly relevant to your question, but I sleep upstairs and our bathroom is downstairs, so I use the equivalent of a chamber pot to urinate in. My lawn gets about two gallons of 11% nitrogen a week that way. I'd say that's a good thing. I normally have to get up int he night for a wee, but our only toilet is upstairs so I'm okay! I tend to go outside becasue we don't ahve a downstairs one! That's a daily thing in our house - we have currently just one toilet inside and an outhouse (six people), which our kids hate (because there might be spiders). In summertime it's ok, but during the winter it might be a bit... embarassing, because of all the yellow snow. Of course it is much easier with the boys. Only thing to keep in mind is that they can't pee over anything edible (mushrooms or berries in the woods, vegetables in the garden). And not near the well! I often wee outside whilst on a long walt if caught short. More difficult for a woman but finding a large trunked tree helps. The girls seem pretty good at it. Years ago I was on a chairmaking course and a hippy lady made a beautiful stool and then cut a hole in the top! Col can't pee on the compost heaps like he used to because the house next door bedroom windows overlook! The problem for old ladies - me - is getting up and down!! Tell him night time is his time to shine - I used to in our old place, but discreetly! I am seventy. I still do. But then here in France it is seen as a natural thing to do! The french are more level headed about some things! Wait. Was I supposed to stop doing that at some point? Isn't that half the reason to go camping? Sorry if it's TMI, but I have read in backpacking magazines that there are tiny plastic funnels sold for us ladies so we can take a sneaky pee while standing up. I'm thinking of picking one up; faced with the port a potties at Farm Aid last weekend I would have paid about a million dollars for something like that. It's a good activator and full of nitrogen. I pee there a lot in my garden! Absolutely no problem at all. We are often out all day long in the countryside birdwatching and there's no option but to find the nearest bush to go behind. On a bird tour in India once, the female members of the party, four of us, had to disappear together behind a shack in the middle of nowhere and fling any embarrassment to the wind, it was that or die! The men of course can go anywhere discreetly but it's more difficult for us girls. It's funny that there is embarrassment with this type of thing (although I know why and I feel it as well at times) because we all need to do these things to survive! I feel a motorway traffic jam wee must be the worst for a lady. If you have to go you have to go! When we go to visit family in Scotland it is a normal thing, all rather beautifully scenic but public loos are few and far between. a loo with a view. Much better for the environment as well! Peeing outdoors is a national pastime here in France; but only for 'chaps'. Love these comments! When you have to go you have to go. Recently my car broke down and took it's last gasps as I approached the National Guard Armory. I just got it in the drive there and lifted the hood when my daughter says, "Mom, I have to pee" (of course, right?). So I send her off into the wooded area right next to the barbed wire of the armory. Every time we drive by there we laugh that she is probably on some watch list.